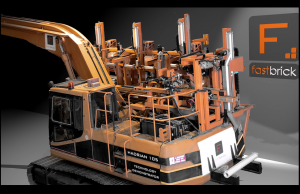 Mark Pivac, an aeronautic and mechanical engineer of FastBrick Robotics, has developed Hadrian, a robotic, fully-automated machine that can build a whole house in just two days. Hadrian – named after the famous Hadrian’s Wall built by Roman emperor Hadrian – can work around the clock, all year long. The robot is currently being developed in Perth and will be commercialised first in WA, then nationally and then on a global scale. With its ability to lay 1,000 bricks per hour, Hadrian can make around 150 houses a year. The robot works by creating a 3D computer-aided design (CAD) laying programme of a house or structure, then calculates the location of every brick and creates a programme that is used to cut and lay the bricks in sequence from a single, fixed location. Using its 28-foot-long arm, the machine puts the bricks in place and secures them with mortar. It can be powered by either a generator or local power sources. Hadrian works about 20 times faster than any human bricklayer and since it is all-electric, it has been designed to minimise greenhouse gas emissions. Pivac put more than a decade of research and development, as well as 7 million dollars into the robotic system. Last week, FastBrick Robotics inked a deal with DMY Capital to take its technology to the ASX, in order to raise the funds needed to commercialise the invention. Under the terms of the agreement, DMY will issue 150 million of its shares to acquire Fastbrick, with another 499 million shares to be issued on condition of completing selected performance milestones. Hadrian has the potential to dramatically increase the pace at which new houses are built, and could slash construction costs. According to Pivac, the machine should not have too much of negative impact on construction employment, given the fact that fewer young people are becoming bricklayers and the average age of labourers is on the rise. Pivac’s FastBrick Robotics recently posted an animated video of Hadrian in action. Check it out.